Google for Jobs is a new search feature published by Google. Simply put, it’s a way that job descriptions all across the web are displayed in Google when someone does a search for job related terms. Just like video and images are given their own special attention and view in Google Search Results, jobs are now also going to be displayed in their own special view. Google’s taken on the role of job aggregator now, and that’s going to shake up the entire job search industry. There will be new challenges for established talent industry brands, and giant opportunities for smaller brands to make unprecedented talent hunting gains if they catch up now and ride the wave of change upon us. What does Google for Jobs look like today? Google for Jobs is a new way that Google is showing web pages in search results, specifically web pages that are job descriptions. If Google recognizes that a web page is a job description then that page will be one of the special pages qualifying to be shown in this view. For example, if someone searched in Google for “nursing jobs in Baltimore” the jobs that match that description are now listed in an improved user interface, not in the classic way Google displays web page results. The way someone starts a job search session is the same as searching for any other term on Google Search, but the difference is in how the results of that search are displayed: in a whole new and better interface. Last week we promised we’d reveal how WPJobBoard benefits SEO, how it helps meet the criteria Google is looking for. Conveniently, the scenario of a site publishing jobs is a useful example for explaining what factors Google favors, for understanding how to maximize the traffic that Google sends. The factors that Google pays attention to, when it determines who is going to get the most traffic, are many. However, there are basic core principles that haven’t changed much since Google started. We’ll examine how these principles apply to WPJobBoard and how using it in a website can yield gains in SEO. What’s great about job descriptions or candidate resumes is that they appear organically, over time as jobs are posted and candidates apply. They have to be posted as part of a normal placement workflow. It’s hard to get around typing them in to something, one way or another. But when you leverage WPJobBoard it turns your normal workflow into an ongoing SEO campaign, something other types of businesses would have to invest tens of thousands per year to achieve the same SEO effect. What’s the job board SEO benefit? A job board on your website is its potential to increase visits from search engines. There are specific search engine optimization reasons to install WPJobBoard. When you list jobs on your site, job seekers using search engines can find your site. When you list candidate descriptions on your site, employers using search engines can find your site. WPJobBoard allows website stakeholders to publish the content that’s relevant and is easy to link to, frequently. This turns search engine users into visitors that are valuable for your business. The job board SEO potential is enormous. Here’s why: search engine optimization (SEO) involves publishing quality content that meets technical and quantitative criteria search engines expect. Doing SEO correctly causes search engines to show links to your content in search engine results pages (SERPs). WPJobBoard was designed to allow website stakeholders to publish jobs easily, perform the functions of an applicant tracking system on its back-end, and at the same time meet the exact criteria search engines are looking for. WPJobBoard 4.5 and Jobeleon 1.4 can now be downloaded using automatic updates or directly from the client panel. If you cannot see the update notification in your WP Admin panel go to wp-admin / Dashboard / Updates and click “Check Again”. This is a major release focusing mainly on job applications, we wanted to build a basic applicant tracking system to make managing applications easier for both Administrators and Employers. The Employer Panel had “Jobs” and “Applications” sections rebuild, from now on Employers can list all applications they received or filter them by job and status. They can also rate and change application status directly from the applications list. The Employer has all the important information at a glance. The application details pages look very similar to the list, but they are extended with additional information included in the form and navigation buttons to quickly switch between applications. Similarly, the list of jobs in Employer Panel was updated to make managing jobs and applications easier for the administrator, this is a first from few of the updates we have planned for the Employer Jobs List. Notice also the handy red icon informing Employer that there is an application with status New which Employer did not saw yet. The applications list in wp-admin also has basic applicant tracking features since version 4.5.0, the list allows to sort applications by Posted and Rating columns, it also allows to filter applications by Job by clicking on selected job title. We made sure to include only the most important information on the job applications list, but at any time you can add additional columns to the list using Screen Options button (at the top right when on applications list). One great feature in the Application edition in wp-admin panel is the ability to select if candidate should be notified about job application status change via email, to do this simply click “Edit” button next to Status, select a new status, if the status has a notification email setup then below you will see a checkbox which will allow to select if the Candidate should receive notification when you update the job application. FIXED: Stripe integration now sends the cardholder name to Stripe when charging user (this will decrease charge failure rates for American Express cards). If you need a list of changed files you can get it from the files changelogt . Today we are releasing WPJB version 4.4.7, this update took much longer than I originally expected but it was well worth it to put extra time into development, the new updates takes the transactional emails in WPJB to completely new level. Emails are the most common communication method with potential employers and candidates, make your email stand out from other recruitment companies by sending beautifully crafted email templates perfectly matching your company branding, and the best part is, you can do all of that without any programming knowledge. If you are familiar with HTML, you can edit the email HTML template and create your own unique and custom email template that will best represent your company brand. 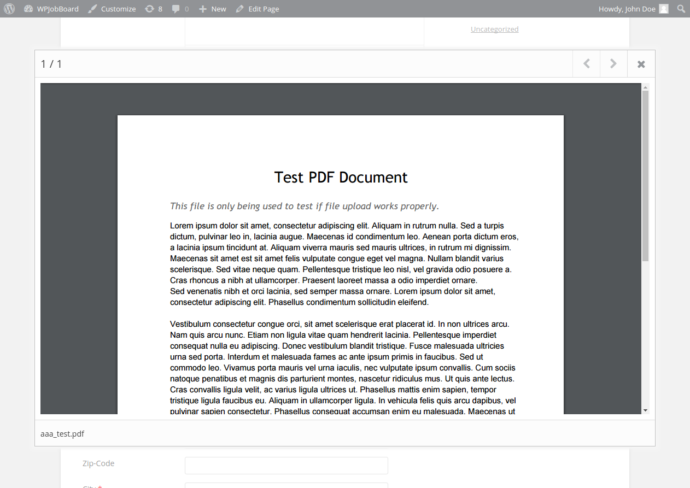 When editing individual email templates you can preview the email template (both plain text and HTML) at any time to see live if you are getting exactly the result you are looking for the preview tool also allows to download your generated email to a HTML file so you can test it in different email clients using tools like Litmus. We also redesigned the Insert Variable button, variables are grouped and each contains description explaining what data does the variable contain. If the client does not support HTML emails he will see a plain text version of the message, so you can be sure that client will be able to read the email no matter what email client he is using to read the email. The emails include responsive CSS code, so they will look good on desktops and on mobile devices. All the CSS code is automatically inlined (using Emogrifier) to make sure that the email will display the same across all the email clients. some typos in in text fixed. API wpja_form_init_membership and wpja_form_save_membership filters added. Fixed (for security) it is no longer possible to configure file upload fields to allow uploading PHP files, that is even if you allow uploading any file type, the PHP files will not be uploaded. Fixed full-text search when the search word contains “+” sign. Fixed make sure that correct resume id is set when adding Education or Experience (to avoid setting it to 0). Fixed setting correct employer_id when uploading a job. The complete files diff you can download here wpjb-4.4.7.txt. Today we are releasing WPJB 4.4.6, this update includes some small incremental changes that will make it easier to configure and customize to your needs. Along with this release, we are also releasing Jobeleon 1.3.6 with a couple of minor bug fixes. You can update either using automatic updates the new release should be visible in your wp-admin panel within 24 hours or you can download the latest version from the client panel. Ok, so what’s new in this version? The Label field allows displaying your custom text or HTML message inside the form. Redirects and Custom Slugs – from wp-admin / Settings (WPJB) / Default Pages and URLs panel, it is possible to setup custom page to which user will be redirected once some action will be triggered. Currently, the redirects can be applied to following actions: User Registered, User Logged in, User Logged out and Job Application sent. From the same panel you can setup custom slug (page name) for a job, resume and company details pages, so you no longer need to have jobs at http://example.com/job/test-job/ you can have them at for example http://example.com/gig/test-job/. Stripe Update – Stripe integration was updated to latest version, there is no visible change on the outside but if you are using Stripe make sure you have PHP 5.3 or newer installed on the site otherwise it will not work. If you are using a reputable hosting company you can be pretty sure that you already have PHP 5.3 or newer installed on the server. General Job Application Form – the general job application form (that is [wpjb_apply_form] shortcode) from now on will show a success message if the form was filled properly and submitted, additionally if param job_id is set the job application form will send a notification to Employer who owns this job. Custom Admin Email – when some email notification was sent to Administrator WPJB was using an email address specified in wp-admin / Settings panel, from now on if you would like to use a custom admin email address you can enter it in wp-admin / Settings (WPJB) / Common Settings panel. 404 Header For Expired or Inactive Jobs – If job expired or just is disabled the Job details page will display with a 404 header informing search engines that this page no longer exists unless in WPJB settings administrator allowed users to view expired jobs. The full list of modified files you can view in wpjb-446-jobeleon-136.txt file. WPJobBoard 4.4.5 and Jobeleon 1.3.5 were just released and you should see the update notification in client panel in less than 24 hours, if not then go to wp-admin / Dashboard / Updates panel and click “Check Again” button, this should show you available WPJB updates. Unlike WPJB releases this year, version 4.4.5 is more of a maintenance update with bug fixes and small improvements, but it also has one major feature Extended User Moderation. From wp-admin / Settings (WPJB) / Job Board Options and Resumes Options panel, you can enable user moderation and disallow newly registered users to access candidate or employer panel, until Administrator will approve them. Once approved, the user will receive an email informing him that the account was approved and where he can log in to his dashboard. The email content can be edited from wp-admin / Settings (WPJB) / Email Templates panel. FEATURE: When logging in or registering from job details page, the user is redirected back to the job details page on success. FEATURE: From wp-admin / Settings (WPJB) / Indeed panel, it is possible to enable conversion tracking. FEATURE: Options in wp-admin / Settings (WPJB) / Job Board Options and Resumes Options panel were reorganized to group related options together. FEATURE: PayPal integration will now display actual HTTP error messages if the payment fails due to HTTP error. FIXED: Error message displayed when trying to republish a job. FIXED: Incorrect page_id parameter value in “Jobs Search” widget. FIXED: Some phrases (“Save” and “Cancel”) were not marked for translation properly. FIXED: Resumes become disabled after updating them from wp-admin / Job Board / Resumes panel. FIXED: Resume Education and Experience sorted incorrectly (now they are sorted descending by “start” date). FIXED: It’s no longer required for an Employer to have at least one job published before his company profile will be visible. FIXED: Pagination hidden always hidden when searching jobs and resumes by radius. FIXED: Social media integrations (Facebook, Twitter and LinkedIn) will not longer automatically share jobs imported from Indeed or CareerBuilder to avoid problems with duplicate content. FIXED: Restored and improved missing CSS rules on Resume details pages. FIXED: File Upload button not clickable in Apply Online form on sold old browsers. The list of customized files in both WPJobBoard nad Jobeleon you can see in files changelog. WPJobBoard version 4.4.4 was just released, you should be now able to download it from client panel. If you do not see this update in wp-admin panel, go to wp-admin / Dashboard / Updates and click “Check Again” button. Along with WPJobBoard version 4.4.4 there is also update to Jobeleon 1.3.4 available, if you are updating WPJB make sure to update Jobeleon as well. There are three main new features in this update. From wp-admin / Settings (WPJB) / Pricing / Employer Membership panel, you can check “Trial” checkbox for one (or more) memberships. When new Employer registers on site all the Trial memberships will be assigned to him. This is a great way to allow Employers test the Employer account (and get them hooked) without forcing them to spend money. In wp-admin / Settings (WPJB) / ANTI-Spam panel you can enable two ANTI-Spam techniques, they are both easy to a user (that is they are invisible to a real user) and hard for bots. You can read more about this technique in ANTI-Spam documentation. Additionally, all IP addresses who fail the ANTI-Spam tests are being logged if some IP address occurs often you can use some third party plugin to ban this IP address from your site, the example error log you can see below. From wp-admin / Settings (WPJB) / Categories and Job Types panel you can enter an order (integer) for each item, this allows to setup custom order for job types and categories. From the version 4.4.4 items are ordered first by “order” value and then alphabetically. In other words, if you will not make any changes in your categories and / or types, then your data will be sorted by title as they currently are. FEATURE: Ability to customize job feeds (Indeed, Juju, SimplyHired, Trovit and RSS) via API. Example code explaining how to use this API you can find on GitHub – Feeds API Snippets. BUG: Datepicker in Education in Experience no longer allows to enter invalid dates. BUG: Subscribe to job alerts not centered properly on screen. BUG: qss=7 in the job description preview. List of modified files you can download here. WPJobBoard 4.4.3 and Jobeleon 1.3.3 were just released and you should be able to update to the latest version using automatic updates. (If you cannot see the update in wp-admin panel, go to wp-admin / Dashboard / Updates and click “Check Again” button.). What is new in WPJobBoard 4.4.3? Until now, resume edition both in wp-admin and frontend was really time-consuming, you need to edit each panel separately, wait for a page to load, fill the form, save it go back to My Resume view rinse and repeat for another panel. Version 4.4.3 resolves this problem, now the whole resume can be edited from a single page, with a user-friendly interface. Play the short video below to see how it works. Ability to login using email (this was actually possible when WordPress made it possible but now also the label in login form reads “Username or Email” instead of “Username”. As a bonus, you can download and use a free “Register Using Email” addon which will remove the “Username” field from both Employer and Candidate registration forms. Updated Resume Completion calculation – specifically when Experience and Education fields are trashed they are not being included in the calculations. Automatic Updates via SSL – WPJobBoard communicates and downloads WPJB updates over secure SSL connection. WPJB incorrectly restricting access to My Resume Avatar, on some configurations this made avatars display as “broken” images. Few XSS vulnerabilities removed (not disclosing where for security reasons). Some phrases marked incorrectly for translation. Latest Jobeleon version has two updates if you are updating WPJobBoard make sure to update Jobeleon as well. Listing Type field on Add Job Page updated to match the new look default WPJobBoard template has since version 4.4.2. My Resume template files updated, so the Jobeleon can take advantage of new My Resume editor. Download list of modified files here. WPJobBoard 4.4.2 was just released along with Jobeleon, it should become available in your wp-admin panel within 24 hours, if you do not want to wait go to wp-admin / Dashboard / Updates panel and click “Check Again” button it should allow you to update instantly. Along with WPJB 4.4.2, Jobeleon 1.3.2 was released, the Jobeleon update is optional, the old one should work fine with latest WPJobBoard version. Updated XML Import – Until now the import either finished or was proccessing XML file forever, in latest version it will either finish or display an error explaining what went wrong. More over each imported item will have its own log informing Admin if the item was inserted or updated and show notices (for example if you are trying import meta field which does not exist). There is also one change in the import itself, until now if the <id> tag was provided WPJB would either update item with this ID or skip this item, in version 4.4.2 if <id> is provided, but does not exist in database WPJB will create an item with this ID. From the image above you can see that one job was added, one application, company and resume were update. Additionally 5 warnings occured when updating application and one warning when importing company. The warnings do not stop the import, they only inform Admin that some data was not added. FEATURE: redirect_to and form_only params in [wpjb_jobs_search] and [wpjb_resumes_search] shortcodes. FEATURE: job_id param in [wpjb_apply_form] shortcode. 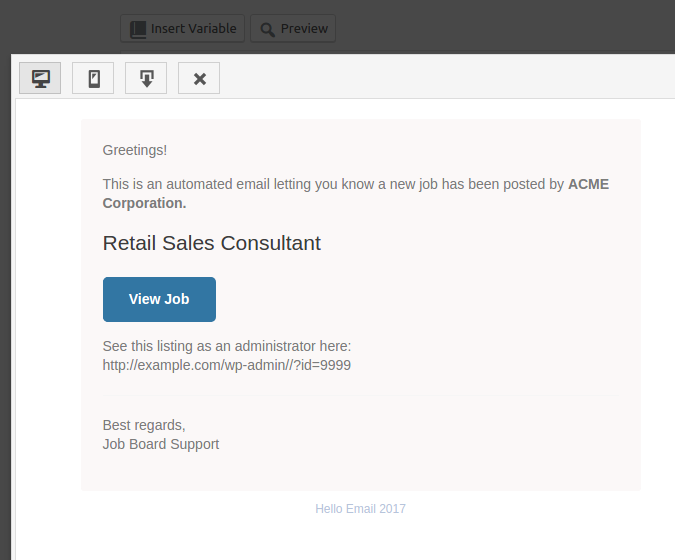 FEATURE: Approved, Active, Is Filled and Is Featured columns added in wp-admin / Job Board / Jobs, Screen Options and CSV Export. FIXED: Screen Options does not show when labels are changed in left wp-admin sidebar. FIXED: Indeed Backfill optimization, disabled some DB queries not required when searching Indeed. FIXED: Logo files missing in CSV export. FIXED: Some random “s” letter showing when editing categories. WPJobBoard 4.4.1 has been just released, and you should be able to get either using automatic updates or from client panel. Until now job board wp-admin did not behave well, when viewing it using mobile device, this was fixed and now all the WPJB pages in wp-admin panel are responsive and you can manage your job board using mobile device just as good as when viewing it using desktop. 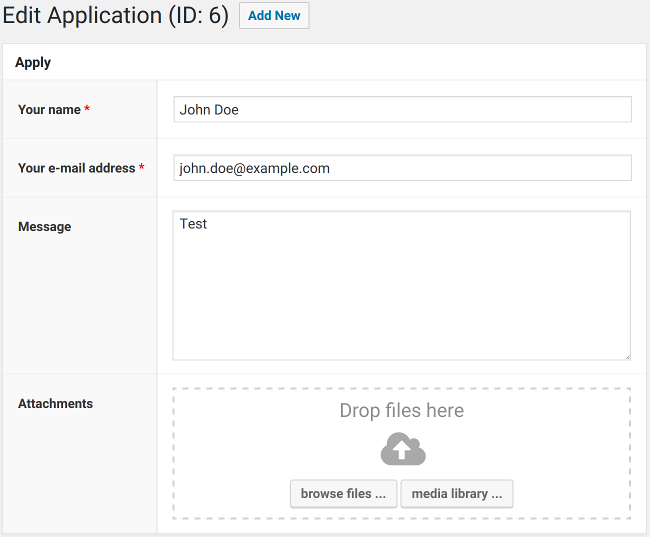 Drag and drop file uploads. Uploading files especially when sending job applications is a crucial part of job board, yet usually no one likes to do it, you click on the button, search for a file on your system and then upload it. With new drag and drop file uploads users can just drag a file from their computer into browser window and have it uploaded, it’s easy, takes a lot less time to do and will definitely encourage users to fill job application forms. Linking files from Media Library. On the image above you can also see “media library …” button, this will allow users to use a file already uploaded into Media Lbrary, if you are using the same logos for most of the jobs this will allow you to save a lot of disk space and make selecting files even faster ( Download Woocommerce Plugins ). Note that the “media library …” button will show only to users with upload_files capability (basically Administator and Editor), if you want to make it visible to other users as well, you need to grant upload_files capability to this roles. If this is not easy enough, we also prepared a free add-on which will allow your users upload files directly from their Dropbox account. This is a must have add-on if your users are often applying from mobile devices, they usually do not have files there, but have the file on their Dropbox account. Download Upload From Dropbox add-on. Finally the new file upload allows to quickly preview uploaded files without opening new window or downloading them to your computer. This will work for most image, PDF, video and audio files, unfortunately won’t work for Microsoft Office files, as brwosers are not able to natively open this files. FEATURE Jobeleon Update Notification, if you are using Jobeleon and the WPJB version you are using requires a newer Jobeleon you will see notification in wp-admin panel. REMOVED “Attention! This job is …” message was removed as it was causing a lot of confusion and users often wanted to hide it. If you were using this feature and want to continue using, then you need to copy code available in WPJobBoard Snippets Library into your theme functions.php file. FIXED Incorrect error message in login forms when reCAPTCHA value is incorrect. FIXED Make it possible to translate “Job Board” and “Settings (WPJB)” menus in wp-admin panel. FIXED Allow to add items to “WPJobBoard Menu” widget without saving it first. FIXED Resume Files security, unprivileged users can no longer see files uploaded into resume, even if they know a full URL to the file. On existing site to enable this file protection go to wp-admin / Settings / Permalinks panel and click “Save Changes” button to reset WordPress router. FIXED Renaming admin menu items removes “Screen Options” on Application, Employers and Resumes pages. FIXED Some Google Maps related files not being loaded. FIXED Automatically generate job slug if not provided when posting a job from wp-admin panel. Jobeleon had mainly updates required to make it compatible with latest WPJobBoard version, additionally one annoying bug in responsive version was fixed. The bug made WPJB leave some blank space on the right side. You can download list of modified files here wpjb-441-jobeleon-131.txt. Version 4.4.0 was just released today, this update includes few major changes mainly in payments, if you wish to upgrade please do it on a test / development server first or at least backup your site before upgrading … so what’s new? This is a major change in how payments are being handled (and a first step to WooCommerce integration). First thing you will notice is that fields “Payment Gateway” and “Discount Code” were removed from Add Job form and were added to the Checkout (third step). This allows to manage all payments related data from one place, and on top of that users who abandon checkout have ability to finish payment later, the link is visible in Employer Dashboard or Administrator can send them link by email (maybe even with a discount code to encourage user to publish an Ad). On top of that when payment is finished user can see clear instructions on what to do next (this is specifically useful with payment method like Stripe where whole payment is done on site). See video below to check how the new checkout, taxes and stripe work togheter in order to create wonderful user experience. New version allows to configure Taxes, if you enable them from wp-admin / Settings (WPJB) / Taxes panel in the checkout the tax will be added to the price (or the price will include tax depending on your choice). This feature is already documented in knowledge base on Taxes page. Stripe integration was rebuilt, it now stores Stripe customer id for each client, which allows users to safely store their credit cards (on Stripe servers) and quickly re-use them when making a payment. Additionally the Stripe payment form was rebuilt so it will always display nicely as any other WPJobBoard form. There were two changes to Google Maps, first when searching by location the map will automatically move to the closest result. We also fixed problem with multiple pins in a single location, since version 4.4.0, when there is more than one pin in the same spot the modal window with information about job will have pagination and will allow to browse details for each job. 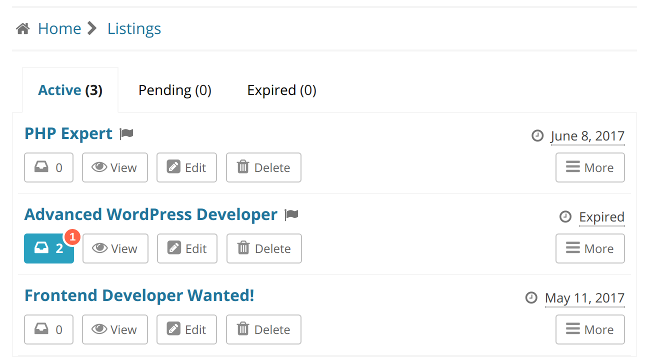 Until now Employers could see only Active and Expired jobs, in version 4.4.0 tab “Pending” was added it will display jobs in moderation and jobs pending payment (with a link to finish payment). Dependency on “Anyone can register” option in wp-admin / Settings / General panel was removed. For some time now the registration forms are created using shortcodes, so if you do not want to allow user registration just trash pages with [[wpjb_employer_register]] and [[wpjb_candidate_register]], having this dependency was confusing and users often did not understand how to enable registration. FIXED Bug not allowing to view job applicant resume in some cases. FIXED Replaced eregi_replace() with preg_replace() to make WPJB compatible with PHP7. As usually with WPJB relase a new version of Jobeleon is released as well. If you are going to upgrade to version 4.4.0 this is a mandatory upgrade for you as well (latest WPJB will not work properly with older Jobeleon versions if you are using payments). Aside of making Jobeleon compatible with WPJB there are two main changes in Jobeleon itself: compatibility with hentry microformat, fixed some incorrectly set language domains (sometimes “wpjobboard” was being used instead of “jobeleon” which made some phrases not translatable). View list of changed files. Version 4.3.4 was just released. The main feature in the new version is updated integration with Indeed, right now aside of importing jobs into your database, you can configure the integration to automatically append jobs to the jobs list. This will make your site look active and filled with jobs even if you have just one internal job. When clicking on job title, the new integration goes to Indeed site, so there are no job details pages, however having it developed this way allows to earn commissions on sponsored clicks. The “how to” is already fully documented in knowledge base, see the Indeed Integration. The new WPJB version allows to customize job application statuses: create, edit and delete them, select default application status and apply custom email templates that will be sent when application status is changed. plupload updated to the one WP is using, this will fix file upload into job description and improve security. Proper payment method selection when Listing Type field is hidden. XML/CSV export stopping with large amount of data. 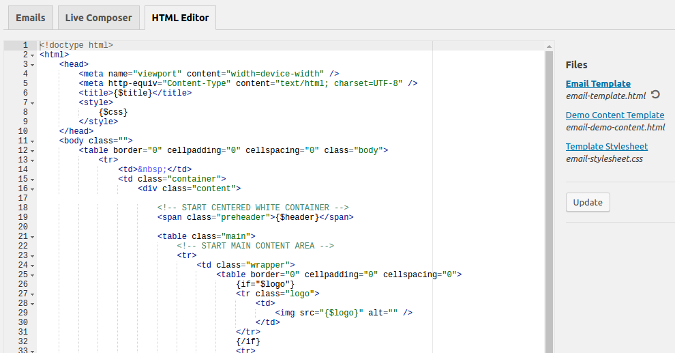 XML export, textarea custom fields values are now wrapped inside CDATA. Params not passed properly when running application/company/resume export. API encryption not handled properly. Visual Editor fixed loop occurring when trying to change name for existing field. Loading WPJobBoard Menu widget scripts. Improved Login API (allows to insert additional links on Employer and Cadidate login pages). Incorrectly closed tags in breadcrumbs. Generating proper category and job type URLs when [wpjb_jobs_list] is on front page. wpjb_api_xml_params filter, allows to customize XML (Indeed, Simply Hired, Juju, Trovit and RSS) on the fly. page_id param in [[wpjb_jobs_list]], [[wpjb_resumes_list]], [[wpjb_employers_list]] shortcodes, they allow to select page to which the form will be sent. wpjb_candidate_name filter, allows to hide candidate from unprivileged users. wpjb_restrict filter, allows to apply verification when downloading restricted files (by default Job Application attachments). List of changed files you can download here wpjb-434-jobeleon-124.txt.